Addison Russell is an Asian American name. And now he’s a newly minted World Series Champion, the first Asian American of Filipino descent to become one since Tim Lincecum, three-time World Series winner while with the San Francisco Giants. After an epic World Series Game 7, Russell, the all-star shortstop, literally a Cub at age 22, wore champagne goggles and stood next to the coveted championship trophy. Traded two years ago to Chicago in exchange for ace starting pitchers who were to have given Oakland a championship (they didn’t), Russell found himself with a core group of young Cubs who were on a mission to end an historic 108-year losing streak, the longest in professional sports. It took two years to end 108. Two years is about how long the current presidential campaign has gone. It just feels like 108. And neither candidate seems as lovable as Russell or any of the Cubbies. Regular readers of this column know I like to use baseball as an escape from the stuff I usually write about in the news, like race and politics. And you know I have written extensively about the San Francisco Giants’ three World Series wins in six years. Because the Cubs eliminated the Giants in the first round of playoffs, I was a tad reluctant to back them this time. I know long-suffering fans in Cleveland too. But then I discovered Russell’s Filipinoness, half through his mother Milany, and I was on board. And how convenient. The game would dovetail with my coverage of the election. How could the campaign ignore a televised Game 7 that doubled all predictions and drew 40 million viewers? Of course, the candidates inserted themselves as they play out their own electoral Game 7. Nothing like a few seconds of innuendo. It almost makes you scared enough to vote for Trump. Only Trump’s “lies and scandal” are far more real and egregious (“Access Hollywood” anyone?). And we’ll never know how deep Trump’s corruption runs, as he’s failed to be transparent on even his tax returns. Reports do indicate Trump’s charities benefit him more and do less good than one would expect. But the key phrase in Trump’s ad is “new investigation.” The FBI is reviewing old emails, some of which may be duplicates, and it’s part of the same investigation deemed unworthy of prosecuting. And all of this thanks to FBI Director James Comey’s letter to Congress last week announcing that he’s continuing the investigation into Hillary Clinton’s emails. Only through leaks do we know that it’s tens of thousands of emails from former Congressman Anthony Weiner’s computer, which he shared with his now-estranged wife Huma Abedin, a top Clinton aide. These emails may or may not be duplicates in an investigation deemed not prosecutable last summer. In other words, it’s either nothing. Or a whole lot of nothing. But that FBI letter gives the gift of innuendo to the Republicans. It’s an inexplicable breach of protocol–to comment on a pending investigation—and Comey knew it. But his team was down, and he had a cover story for anyone who doubted him. He had a duty to inform Congress, right? No, he had a duty to shut up and let his agents do their job. The consequences have been apparent in the last week. Polls have tightened, down-ballot Republican candidates have regained momentum, and Democrats are no longer talking about winning back the House and Senate–they’re just hoping to make Blue states bluer to preserve what’s left of a big lead. It’s sort of like the Cubs, who had the best record in baseball this year, only to find themselves down 3-1 lead in the series on the brink of elimination–the overdog clawing its way back from underdog status. Game 7 was like a mini-seson. The Cubs took a 1-0 lead, lost it, then powered to a 3-1 lead in the 4th. They held steady at 5-3 in the 5th; 6-3 in the 6th; then blew the comfortable lead entirely in the 8th when Cleveland’s Rajai Davis homered to tie the score, 6-6. The game was so tense, the ads were actually a relief. They came on during those unguarded moments when people might be reachable in a new way. So maybe the ads had more impact. Hillary’s ads were just as negative as Trump’s. They showed Trump in his most foul and vulgar moments. There were “F” words, “p” words, and all were put into the public policy context of a President Trump. Another shows kids watching Trump talking like a bully. This is the public Trump. It’s X-rated enough. Can you imagine what would be revealed if Wikileaks went after him? Good thing there was a real Game 7 to get back to. It ran 4 hours and 28 minutes, including a 17-minute delay for a cleansing rain. Not exactly a November Surprise. Rain was in the forecast. But it was moment enough for a contemplative pep talk, and then one last tenth inning rally, when the Cubs scored twice, and Cleveland just once. Game over. A one-run margin. It was that close. One run. Addison Russell’s shallow sacrifice fly to center drove in a run in the fourth to give the Cubs a 2-1 lead. It wasn’t like his Game 6 performance, when he drove in 6 runs with a double and grand slam, the margin of victory in a 9-3 win. But that was a “must win” that got the Cubs to the winner-take-all Game 7, and Russell, the young champ, did his part. The World Series is over, and as fans, we watched. We didn’t play. But we have our memories. The presidential campaign? It has a few innings left to go. But unlike the World Series, we get to play in this game. You’re not going to let a little negativity make you stay home? You’re not going to protest and admit you don’t matter? One run margins count in baseball. One vote margins count in elections. While the game was on, Hillary Clinton, a Cubs fan, was reportedly watching the game on an iPad. I suppose she helps balance things for conflicted Cubs fans since the team’ s owners, the Ricketts family, are major donors to Donald Trump. On game day, Clinton was in Nevada, talking to voters in a battleground state that has turned more Republican since the FBI/Comey letter. For Asian Americans? Do we matter to Trump when we don’t even show up in polls? Will he see us as linked to our forebears, as perpetual foreigners? Or like the Gold Star family of Khizr Khan? With the Cubs on top of the world we have an Asian American of Filipino descent and people hardly know it. 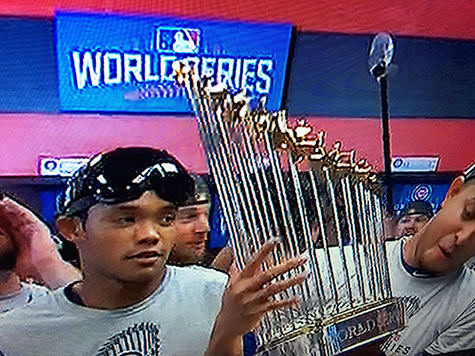 We’re there with Addison Russell, our champion. And we’re champions in the most important game that matters, too. The one where we actually get to hit. Don’t forget to play in democracy’s Game 7. Your voice needs to be heard. Vote.